Manual material loading and automatic cutter feeding / retracting provides high operational speed and greatly increase productivity. The semi-automatic model has 2-step feed speed. 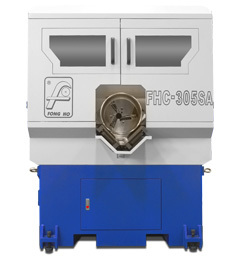 The first step feed is high speed, then the second step feed speed is adjustable to produce clean and smooth cutting results. 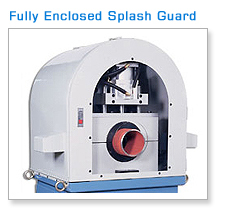 Changing sizes of cut are conveniently made by simply adjusting and changing cutterhead and clamp. Speed change on model 50SA、85SA is made through pulley for chamfering various materials of workpieces ensuring long service life of cutter. Models 110SA and 150SA employ-change motor to change speed for chamfering various materials of workpiece, ensuring long service life of cutter. Applicable Materials Various pipes including steel, iron, stainless steel, aluminum, bronze, non-ferrous metal, plastic and graphite fiber. 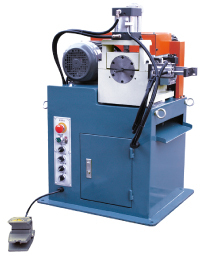 * This custom machine is designed by customer providing workpieces specification and drawing. Please specificate the OD and ID, and end-face and outter angle of the workpiece. According to customers, special needs, we made custom machine, length of workpiece; 50mm~100mm above. All specifications, dimensions and design characteristics shown in this catalogue are subject to change without notice. 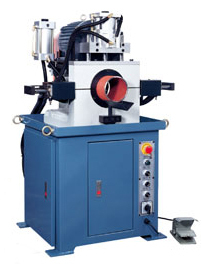 Products specifications are based on the actual machines.The manufacturer holds explanation rights.